COMPOSITION: Addition curing vinyl polysiloxanes, hydrogen polysiloxanes, fillers, pigments, additives, platinum catalyst. INDICATION :Crown and bridge impressions, Inlay and onlay impression. ADVANTAGES : Silagum Putty -Easy dosage. Excellent recovery after deformation. Easy removal from mouth. Expectional kneadability. Good dimensional stability. Especially suited for two-phase impressions with Silagum-Light/Fast. Instructions for use: Silagum-Putty can be used in all common impression trays. In order to improve the adhesion of the material to metal or plastic trays, a tray adhesive can be applied (e.g. DMG Tray Adhesive) Removal of the impression : Remove the impression parallel to the longitudinal axis of the prepared teeth. Storage and shelf-life : Store at room temperature (15 – 25 °C/59 – 77 °F) in a dry place. Protect against exposure to direct sunlight After the application, leave the used tip on the cartridge to cap unused material Close the can again immediately after use .Do not use after the expiration date. 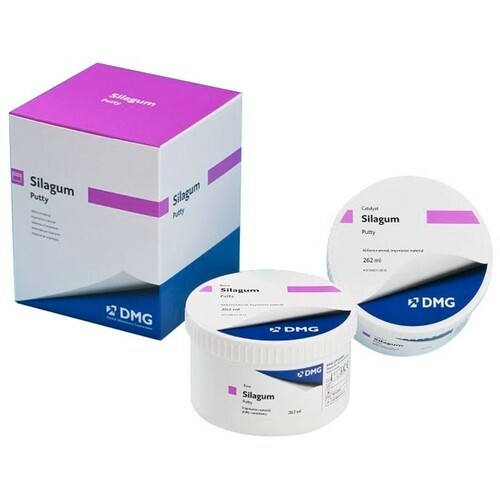 Available as normal or fast setting materialInstructions for use Silagum-Putty can be used in all common impression trays. In order to improve the adhesion of the material to metal or plastic trays, a tray adhesive can be applied (e.g. DMG Tray Adhesive) Removal of the impression Cleaning and disinfection of the final impression : Only disinfect the final impression using dipping solutions. DMG recommends the use of a 2 % glutaraldehyde solution.Please ensure that the disinfectant used is indicated for use with addition curing silicone impression materialsFollow the instructions of the disinfectant solution’s manufacturer preciselyLeave the final impression to dry and store until casting . Storage of the impression: Store impression at room temperature (15 – 25 °C/59 – 77 °F) in a dry place!Protect against exposure to direct sunlight! The impression is stable and can be cast even after months without loss of accuracy. Disinfection of the Automix dispenser The Automix dispenser is reusable after disinfection, although it should be replaced if visible signs of wear appearDisinfection can be carried out using a commercially available dipping disinfectant. DMG recommends using only disinfecting solutions listed by the RKI (Robert Koch Institute).The Automix dispenser is also autoclavable. Remove the impression parallel to the longitudinal axis of the prepared teeth.